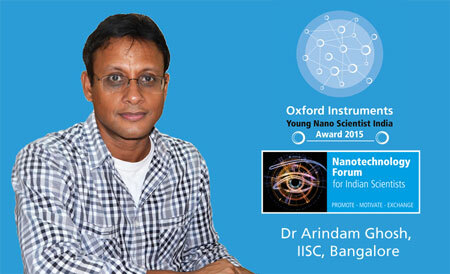 (Nanowerk News) The Nanotechnology Forum for Indian Scientists (NT Forum) is delighted to announce that Dr Arindam Ghosh from IISC, Bangalore is the first winner of the ‘Oxford Instruments Young Nanoscientist Award 2015’. The NT Forum was formed in 2014 and at the same time, launched the Award to acknowledge outstanding research in the field of fabrication and characterisation of nano materials and structures in physical or bio nanotechnology. The award was well received across India and the NT forum received 43 nominations from many eminent researchers. The winning nomination is titled “Thermodynamic and Transport Properties of Emerging Low-Dimensional Materials”. Dr. Arindam Ghosh was announced the winner of this award for his outstanding contribution to Nano Science in India. “The NT Forum received good quality nominations and the committee is delighted that Dr Ghosh is being recognised for his outstanding work. Nanotechnology research in India deserves global recognition for the good quality research carried out here.” said the Chairman of the selection committee for the NT Forum, Bharat Ratna Professor C.N.R Rao. Anurag Tandon, Managing Director, Oxford Instruments India Pvt. Ltd. said “Oxford Instruments is pleased to see such an overwhelming response from the nanotechnology community in India. The quality and calibre of nominations received this year are very encouraging, and highlights the strong capability of Indian researchers. Dr. Arindam Ghosh fully deserves this recognition for his research and I look forward to congratulating him in person at a formal awards ceremony to be held in April”. As winner of ‘Oxford Instruments Young Nanoscientist award 2015’, Dr. Arindam Ghosh will be awarded with a certificate, trophy and cash prize for his achievement. The NT Forum will also arrange for him to deliver talks in foreign universities as invited lecturer.